Always wanted to pick up playing the Ukulele? 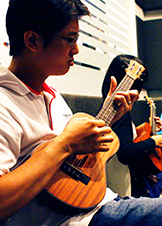 This school holiday, experience the thrill and passion of playing the UKULELE for real. Following Believer Music's innovative and revolutionary approach to music learning, your child will play this instrument with purpose and focus. Team dynamics will encourage each child to actively collaborate with others to make music as a team. The strumming exercises will also foster better concentration, listening ability, communication skills, and develop both fine and gross motor skills. This 3-week module will inspire your child to engage joyfully with the harmony of music. Is there a difference between the Beginner (School Holiday Program) module and the usual Beginner module? What do I learn in 3 weeks? Conducted in small groups (i.e. 6-8 persons), the 1.5 hr per week sessions include: INTRODUCTION to the ukulele and its role, essential RHYTHM fundamentals, CHORD theory and formations, SONG APPLICATION with your favorite praise & worship songs. I received Guitar lessons previously. Is it still applicable in this course? You'll get to meet people who share the same passion. Learning to play a musical instrument is highly rewarding. Learning to play the Ukulele is more than fun. It's life changing. With practice, this skill will stay and enrich not only your lives but also the lives of people and family around you (and generations to come). For many of us who are just starting to pick up this unique skill, believe that the journey is well worth it.